These homes are typically built on site from pieces of lumber that are cut and nailed together into wall and roof sections. They are then linked together and sheathed with plywood on the exterior and drywall on the interior. The exterior is usually finished with shingles, brick, vinyl siding or something similar. Traditional wood framing is not the most efficient means of building, and mistakes made during this process can waste material and drive up costs. Weather can also be a factor in damaging the materials. Once completed, this type of home can be more expensive to maintain. They are generally not as energy efficient and can come with higher utility bills. Building a home can be one of your most important and impactful investments, with ICF construction your investment is naturally protected from the forces of nature and time. A home built using ICFs, coupled with complementary technologies, can provide up to 80% savings on operational costs. All told, the advantages of an ICF home are immense; energy cost savings, noise reduction, even temperatures throughout the home, warmer floors and 180 mph wind resistance. Fire can endanger the lives of everyone in the family and destroy those things that cannot be replaced. Many insurance companies recognize concrete as being safer than any other form of construction when fire threatens a home. Living in a Crane Builders ICF home can bring peace of mind to homeowners concerned about fire. When disaster threatens in the form of storms, floods or fires, your family will be safer in a home constructed with concrete walls. It's no accident that concrete is the material of choice for modern day fortresses and disaster shelters. This strong, durable material stands up to the fury of nature...including the more subtle threats of rot, rust and termites. With land for home building becoming more scarce, we're forced to build our homes closer together and near noise sources like highways, railways, and airports. An ICF home is often two-thirds quieter than a wood-frame home. The greater mass of concrete walls added to the insulating qualities of foam can reduce sound penetrating through a wall by over 80% when compared to wood-frame construction. The predominant raw material for the cement in concrete is limestone, the most abundant mineral on earth. Concrete can also be made with fly ash, slag cement, and silica fume, all waste by-products from power plants, steel mills, and other manufacturing facilities. The Portland Cement Association and the Environmental Council of Concrete Organization acknowledge that concrete builds durable, long-lasting structures that will not rust, rot, or burn. Life spans for concrete building products can be double or triple those of other common building materials. Homes built with concrete walls, foundations, and floors are highly energy efficient because they take advantage of concrete’s inherent thermal massor ability to absorb and retain heat. This means homeowners can significantly cut their heating and cooling bills and install smaller-capacity HVAC equipment. Concrete can be produced in the quantities needed for each project, reducing waste. After a concrete structure has served its original purpose, the concrete can be crushed and recycled into aggregate for use in new concrete pavements or as backfill or road base. ICF is an acronym for Insulated Concrete Forms. Think of ICF forms as hollow “Lego” blocks. ICF blocks are assembled to the desired size and shape of the project. The hollow center is then reinforced with rebar and filled with concrete. The foam ICF forms remain in place, providing insulation, nailing surfaces and a vapor barrier, all in one. It’s ready to finish right away. How long has ICF technology been in use? The origin of ICF technology belongs to Werner Gregori, a German immigrant to Canada. In March 22, 1966 Werner applied for the first ICF panel patent. What is the cost difference between ICF and wood frame? Compared to wood construction, the initial cost difference of traditional building vs. ICF varies from 2%-12%, depending on the design and size of the home. However, an ICF dwelling continues to provide cost savings to the homeowner over the life of the home. A home built using ICFs, coupled with complementary technologies, can provide up to 80% savings on operational costs and may allow homeowners to qualify for insurance discounts and tax credits. 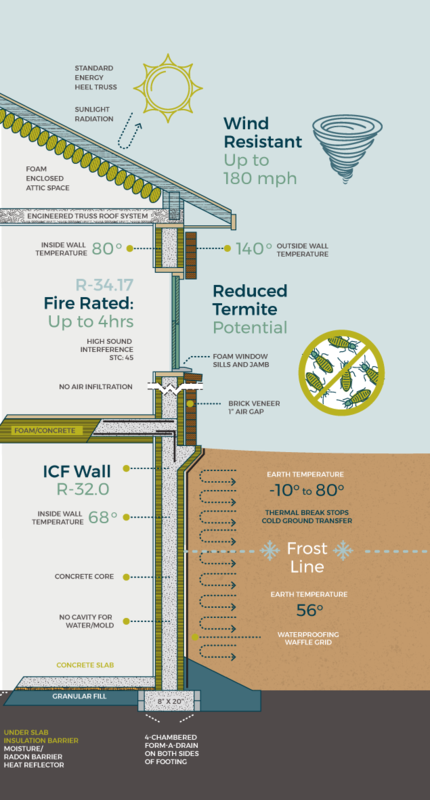 How much wood do you save building with ICFs? You can save approximately 42 trees on an average size home using ICFs. Can I use any floor plan? Yes! Crane Builders has their own 3-D drafting arm that can draw any plan to ICF specifications. In fact, ICFs offer greater flexibility in building a home than wood home construction. There are many new exciting products to compliment the performance of ICFs. Click here to see some of our building styles to give you an idea of the diversity ICF brings. Can you tell if a home is built with ICF just by looking? No one will be able to tell the difference. The outside can have any form of cladding (brick, stone, stucco, siding, etc.) The inside may have deeper window wells, but you can have your walls finished any way you like. The real differences you’ll notice are the sound and air quality, energy efficiency and cost-savings! Can I hang pictures, cabinets and shelving on ICF walls? Yes. Compared to a conventional wood wall with studs every 16 inches, the block used by Crane Builders has a fiber stud every 6-8 inches. In addition, heavy items can be fastened directly to the concrete wall with Tapcon fasteners. How much savings will I see in my energy bills? A home built using ICFs, coupled with complementary technologies, can provide up to 80% savings on operational costs. Are there insurance benefits to building with ICF? It varies according to the insurance company you choose, however your insurance bills will usually go down. Many insurance companies recognize concrete as being safer than any other form of construction. ICF built homes are much stronger than conventional homes, engineered to withstand winds up to 180 miles per hour and more resistant to fire. Will it take longer to build with ICF? It should take about the same amount of time – and sometimes even less time – than building a traditional wood-framed home. 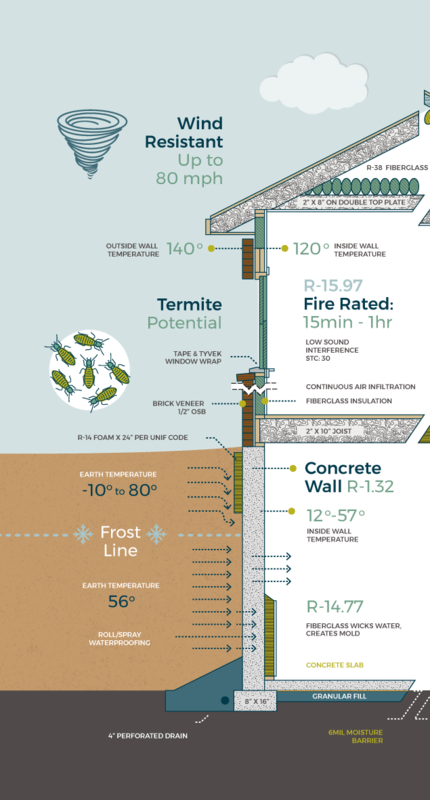 Are ICF walls as strong as concrete block walls? Stronger! When cured, the concrete in ICF walls is 50% stronger. Plus, ICF automatically provides insulation and furring strips, and it’s ready to finish right away! Are ICF walls straight and plumb? When installed by a qualified contractor, ICF walls should exceed conventional standards for straightness. Do the ICF forms stay in place after the concrete is poured? Yes. Actually, the forms act as insulation, nailing surfaces and a vapor barrier, all in one. Do you waterproof ICF walls? Yes, waterproofing is required below grade just as it is with any form of below-grade construction. A wooden or vinyl buck is built and incorporated into the ICF wall as it is being stacked and prior to pouring the concrete. Once the concrete cures, doors and windows are installed as usual. Which size doors & windows forms should I choose? It depends on the home you’re building. Prior to the start of construction, we will choose the wall width based on your design and the structure. How can I visit a ICF job site or a completed ICF home? Contact Crane Builders today at (317) 481-1470 and set up your visit today to see many of their ICF projects.